If it were not for J.K. Rowling and Harry Potter, I would not become the ferocious reader that I am today. I was first introduced to this wizard by my fifth grade teacher, Mrs. Cynthia Johnston, at Indian Valley Elementary School in Overland Park, Kansas. While she only read a portion of the first book to my class, I was determined to find out about what happened to Harry, Ron Weasley, Hermione Granger, Professor Dumbledore, et al. In 2007, Harry Potter and the Deathly Hallows was released and I eagerly anticipated reading the book when I got back from Israel. On July 31, 2016, Rowling, John Tiffany, and Jack Thorne released the final part of Harry Potter story: Harry Potter and The Cursed Child. The book was actually a rehearsal script that followed the adventures of an adult Harry and his middle son, Albus Severus. The play started previews at the Palace Theatre in the West End on June 7, 2016 before officially opened in July 30, 2016. The play was a smash! The London production received 11 Olivier nominations and won over nine awards at the 2017 Olivier Awards. The awards that the play received included Best New Play, Best Actor for Jamie Parker (Harry Potter), Best Supporting Actor for Anthony Boyle (Scorpius Malfoy), and Best Supporting Actress for Noma Dumezweni (Hermione Granger). 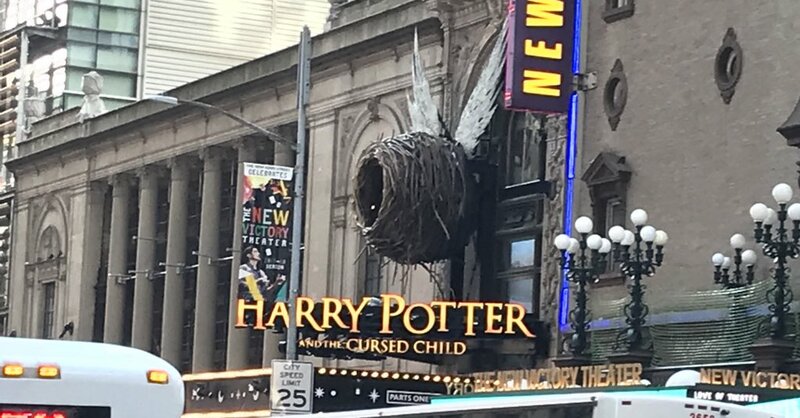 When it was announced that Harry Potter and the Cursed Child would be opening at the renovated Lyric Theatre in New York City, I knew that I had to get tickets to this play. On May 24 and May 25, I had the impeccable opportunity to see both parts. While I kept a solemn vow, to “Keep the Secrets,” I can give you some insight on what you can expect from this outstanding show. What made this show so special is that seven actors from the original London company (Boyle, Sam Clemmett [Albus Potter], Dumezweni, Poppy Miller [Ginny Potter], Parker, Alex Price [Draco Malfoy], and Paul Thornley [Ron Weasley]) helped premiere the American version of this production. While it may hard for some Potter fans not seeing Daniel Radcliffe, Emma Watson, Rupert Grint, et cetera reprise their iconic roles, the five actors made their mark on these classic characters. Parker perfectly brought The Boy Who Lived into adulthood as he struggles with his ability to balance parenting his youngest son, while working at the Ministry of Magic. Meanwhile, Dumezweni delivered an impeccable performance as Hermione Granger and secured her spot as a significant contender to win the Best Performance by a Featured Actress in a Play award. Both Boyle and Clemment produced superb character growth arcs for both Scorpius Malfoy and Albus Potter throughout the four acts. Other standouts in the acting ensemble include Jessie Fisher (Delphi Diggory), Geraldine Hughes (Professor McGongall), Edward James Hyland (Albus Dumbledore), Price, and Thornley. Behind Harry Potter & The Cursed Child’s success is an astonishing production crew. The audience will be amazed with spectacular magical illusions that Jamie Harrison created and that Martin Lowe helped arranged through the play’s four acts. In addition, Christine Jones and Katrina Lindsay brilliantly brought the Wizarding World of Harry Potter to the Broadway stage through their splendid sets and excellent costumes respectively. Finally, Carole Hancock transformed these actors through her excellent make-up, hair, and wigs designs.